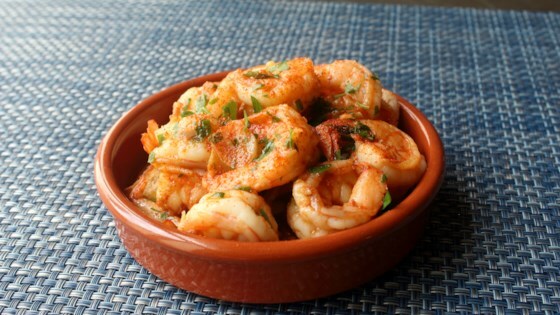 "Every Spanish restaurant serves this dish of shrimp cloaked in garlic-infused olive oil with smoky hints of paprika and a touch of sweetness from sherry. Make sure you have all your ingredients together before you head to the stove since, start to finish, this cooks in mere minutes. It's great for a tapas party, since you can prep everything ahead of time. Just spoon the shrimp and sauce over toasted bread and sprinkle more cayenne and parsley on top to enjoy." Chef John transforms simple ingredients into scrumptious results. Unless you live in a few choice locations, it's rare to find true fresh shrimp at the market. All they do is thaw some frozen, and put it in the case, where it sits until you buy it, which is why it really makes a lot more sense to purchase frozen. To thaw, run cold water into the bowl of frozen shrimp and let it sit for about 10 minutes before draining. Repeat once more. Feel free to substitute sherry with white wine plus a pinch of sugar. This video shows how to properly devein shrimp. This was super bland. I even added chili powder and extra paprika and sherry. Boring! I did make this and it was easy and yummy. Super easy and a hit for the football game.